ESV Study Bible rebound in dark brown morocco, leather floral onlays (red and green) on front cover. 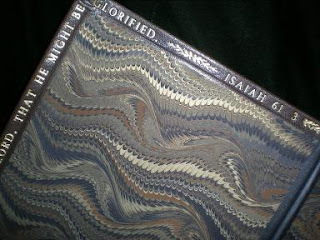 Cloth inner joints, marbled endpapers, Scripture verse tooled around inner dentelles. 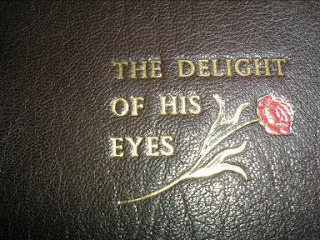 "The Delight Of His Eyes" reference is from Ezekiel and is used in describing his wife.